Even if the saddle valve came with some appliance installation kit, it may not be permitted in your area. You may want to check if such installation complies with your local plumbing code. 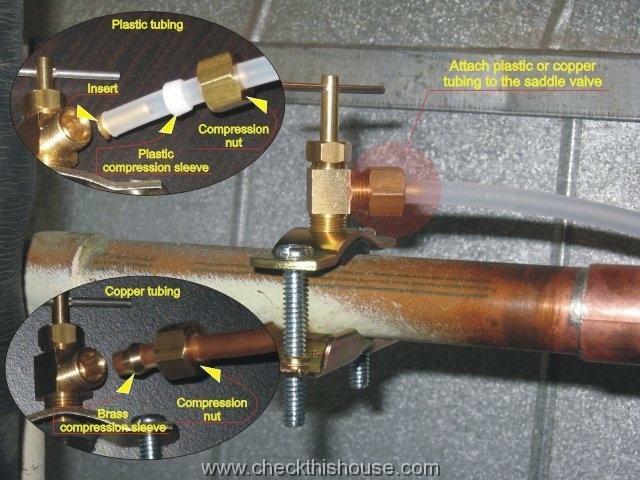 This How to Install Saddle Valve Guide covers copper pipe installation. However, you can also use it for plastic and galvanized pipes since most steps are almost identical, and I will explain the difference whenever it’s necessary. A typical saddle valve application is to provide water supply for a whole house humidifier, ice maker, water filtering / dispensing equipment, or anything else that uses a ¼” diameter supply line. The installation is so simple that in most cases, a professional plumbing contractor will not be necessary … unfortunately there are always some exceptions; hopefully, yours will not be the case. Drill with a 1/8” – ¼” drill bit (some applications / manufacturers might require ¼” diameter hole to provide better water flow, i.e. for the ice maker). For your safety, I highly recommend to use a cordless drill or at least a power drill plugged into a GFCI protected outlet. Wear protective glasses. 1. For the saddle valve installation, pick a cold water supply pipe located as close as possible to the appliance you’re providing water for. The longer the supply tubing will be, the more chances for damaging it. 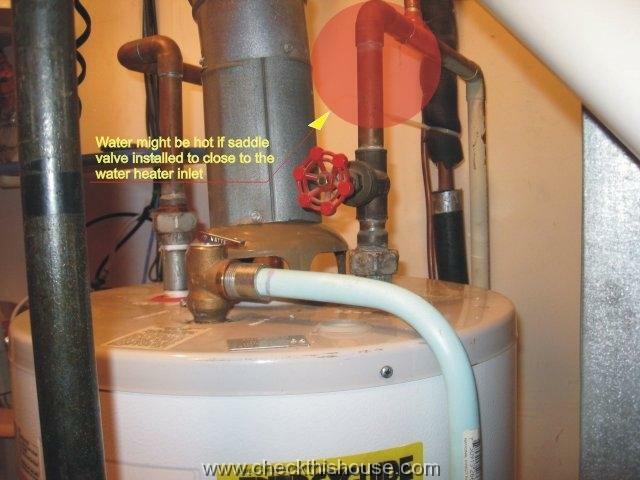 If you’re installing a saddle valve on the water heater supply line, try to move it further from the water heater inlet, so it doesn’t pick-up already heated water. ¾” pipe is very easy to work with, ½” will be OK, but if you try to install the saddle valve on anything smaller than that – it might not work, unless you use a specially designed for this purpose saddle valve / clamp. 2. Close the main water shutoff valve. If you have two valves – close both of them. It is very common for water shutoff valves to start leaking around the stem if not used for a long period of time or if used very often. If it starts dripping, you can try to re-tighten the packing nut (below the handle). This might not work on old valves, and if you can’t stop the leak, it is one of those unfortunate cases that requires a phone call to the plumber (returning valve to the position you’ve originally started from might sometimes stop the leak). 3. 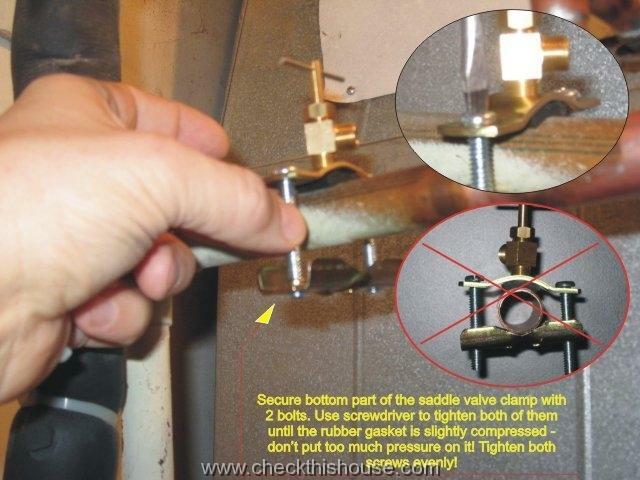 Open the faucet preferably located below the area of the saddle valve installation to relieve the pressure. For galvanized and plastic pipes, since you’re going to be drilling it, I would suggest to open all of the house faucets and drain water from the system. In any case – ask your household members to not use any water outlets during the installation (it will just take a few minutes). 4. Clean the section of the pipe that the saddle valve rubber gasket will be placed on. Paint, corrosion, dirt, and anything else that might prevent a watertight seal should be removed from this small area. You can use a piece of sandpaper (as fine as possible to do the job), steel wool, or even a kitchen scrub-sponge with soap may be just enough. Wipe off any remaining debris with a clean towel. 5. 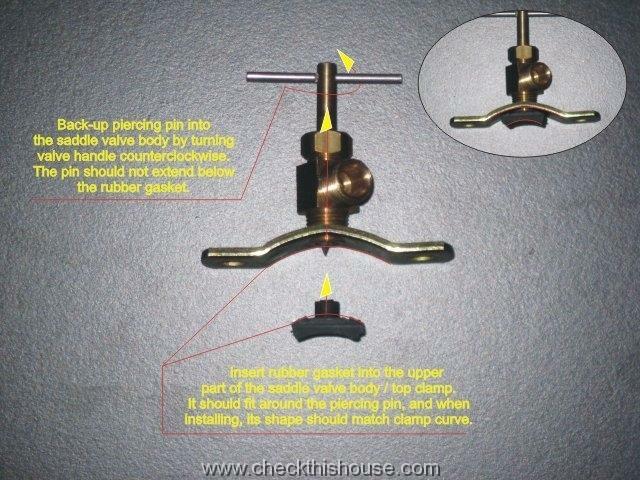 Prepare the saddle valve – the top section of the clamp should be attached to the valve, just make sure that it’s tight. Check the packing nut, you should not be able to turn it by hand in any direction. 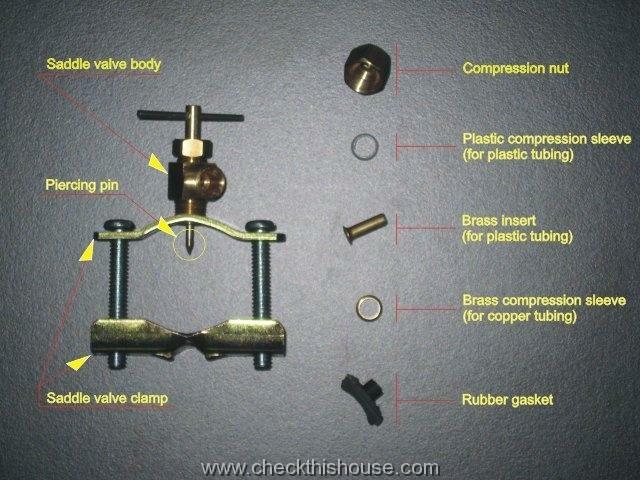 Place the rubber gasket around the saddle valve piercing pin (be careful, it’s very sharp). The shape of the gasket should fit perfectly into the clamp curve. For a copper pipe installation, backup the piercing pin all the way up by turning the saddle valve handle counterclockwise – it should be retracted approximately 1/8” into the rubber gasket. Attach one side of the bottom clamp to the saddle valve top clamp with a bolt (make just a couple of turns of the bolt), or you can do both bolts after placing the valve over the pipe (whatever is more comfortable in your situation). For a copper pipe, skip #6 and go to #7. 6. Drill a 1/8” hole (or larger if required by the appliance manufacturer) in the galvanized or plastic pipe to accommodate the saddle valve piercing pin. If you drained your plumbing system (#3) there should be no spillage, especially if drilling on the upper or side wall of the pipe. However, if only the bottom of the cold pipe is accessible, there might be some water remaining inside the pipe – watch your eyes. Clean debris after drilling, but be careful because there could be some sharp pieces still attached to the edges of the hole. 7. 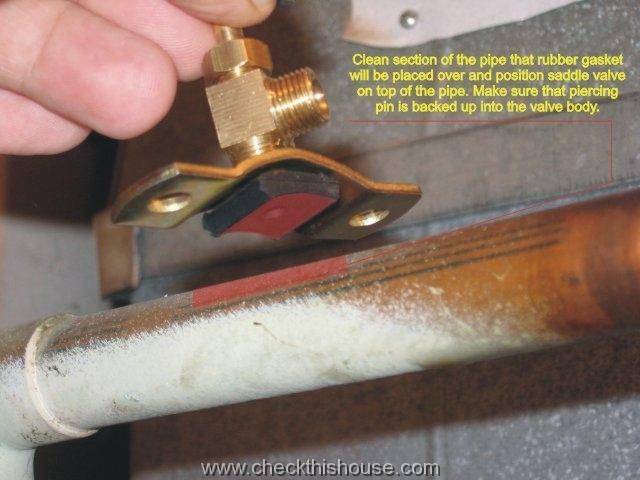 Place the saddle valve on the cold-water copper pipe, with the rubber gasket directly over the cleaned area. Holding onto the top and bottom parts of the clamp with one hand, install the second bolt with the other. You should be able to turn both bolts with your fingers until the clamp firmly touches the pipe. For the final turns use a flat tip or Philips screwdriver (depending on the type of bolts that came with your valve). Make sure that you’re tightening both clamp bolts evenly. When the saddle valve rubber gasket is slightly compressed, stop turning – it doesn’t take that much force to crush the copper pipe. For plastic and galvanized pipes, install the saddle valve with a piercing pin fully extended (all the way down) – this is the “closed” position. 8. 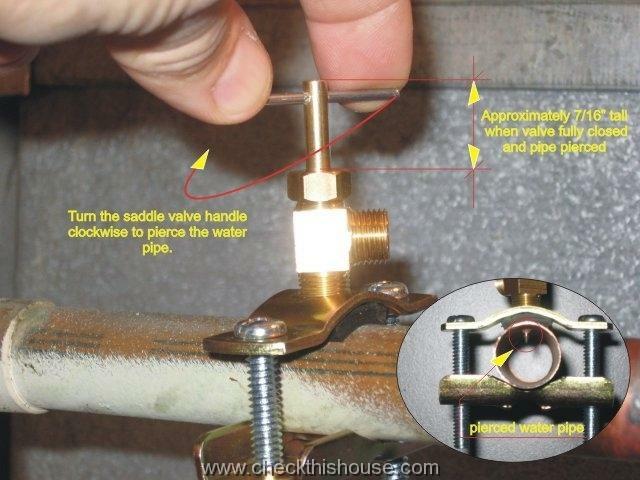 For the saddle valve secured on a copper pipe, start turning the valve handle clockwise. You’ll feel some resistance when penetrating the pipe wall, continue past this moment until you the handle can’t be turned any more. There should be approximately 7/16″ of the stem left above the packing nut when you’re done – this is the “closed” position of the saddle valve. 9. At this point, it’s time to test your saddle valve installation project. 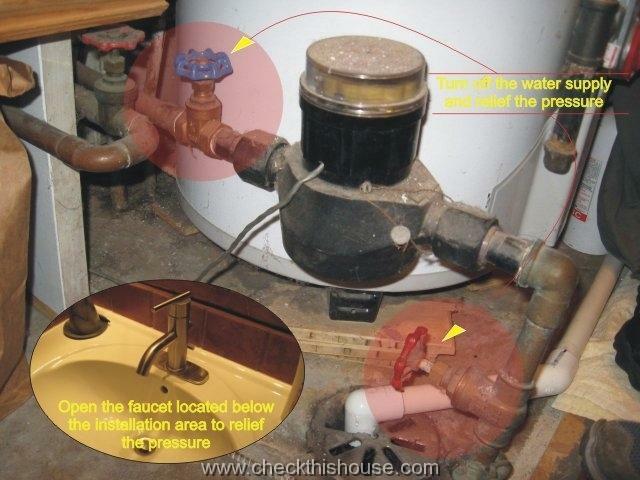 Before you open the water shutoff valve, close all the faucets that you’ve previously open. I would suggest that at this point you attach a plastic or copper water line to the saddle valve and place the other end into a bucket, sink, floor drain, etc. For a plastic tubing, first slide the compression nut on it, then a plastic compression sleeve, and a brass insert (just like on the picture) last. Insert the brass insert fitted tubing into the saddle valve body, slide the compression sleeve and a nut to the beginning of the thread and use your fingers and a ½” or adjustable wrench to tighten it – be careful not to over-tighten it, though. For copper tubing, you just need a compression nut and a brass compression sleeve – this one needs only a little more force – again, take care not to use too much of it. 10. Open the water shutoff valve(s) and start turning the saddle valve handle counterclockwise until you see water running from the attached tubing. Control the flow by turning the valve handle; for most applications it should be open all the way. After testing, close the valve and work on your appliance. 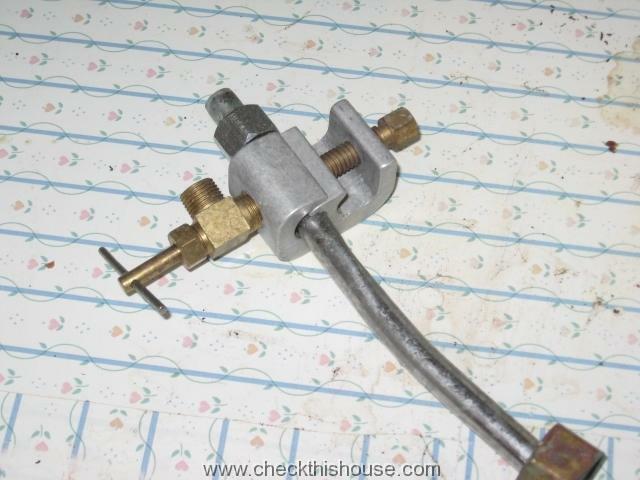 At the water line / plastic or copper tubing connection to the saddle valve – this one might start leaking after connecting the other end to your appliance when pressure builds up inside the line. You’ll either need to re-tighten the compression nut on the saddle valve, or remove it and check the compression sleeve and / or insert for proper installation. Congratulations – you have just completed saddle valve installation – just let me know if you have any problems. I installed valve per instructions, and had to tighten bolts and packing nut as leaking was occurring when water went through. This stopped the leaking temporarily–within 2 hours it had begun leaking pretty well from the gasket. I have tightened everything as much as I dare and it is still leaking, do you have any suggestions. Would taking off the valve and re-installing do anything?? When you attach the copper tubing to the saddle should you use plumber’s tape or something on the threads to help prevent leaks. You should not require any tape or putty on the threads of the compression fitting. Properly installed brass compression sleeve should provide sufficient water tight seal between the copper tubing and the valve. If you over or under tight it, the connection will most likely leak. You have to make sure that the tubing section inserted into the valve is clean, without any dents, and that it goes into the valves opening as straight as possible. The same applies to the brass sleeve – no dents, deformations, etc. A year ago I installed a saddle valve for my refrigerator’s water dispenser and ice maker. I installed it using the piercing pin into my 1/2 inch copper line. The water dispenser has always been slow to fill a glass of water, and sometimes the ice cubes are hollow. Recently the ice cubes got really thin, but I changed the refrigerator’s water filter and that helped a great deal. But the cubes are still sometimes hollow, and the dispenser is slow. I disconnected the copper line running from the saddle valve to the refrigerator to check the flow and it comes out like a little drinking fountain. Do you think it will help if I remove the saddle valve and drill out a 1/4 inch hole or maybe a 3/16 inch hole where the pin puncture is? If yes, any special precautions to take to keep it from leaking? I’ll use a cordless drill. Thanks for your help. I followed your instructions, there are no leaks at the pipe or valve that carries the water to the refrigerator, but no water enters the line. If I remove the refrigerator water line, and leave faucet on I get a steady stream of water from the hole where the line goes. Help! Well, there aren’t that many possibilities. If there’s water running from the saddle valve after disconnecting the refrigerator line, check the line itself. Disconnect it from the refrigerator and try to blow some air into it. If you can feel the air coming out of the other side it means the refrigerator has something that prevents water flow. Look inside the connector on the refrigerator side, check the refrigerator manual for water line connections. Depending on your model there might be electronic lock on it or some manual device that prevents water from flowing. If you can’t blow the air through the tubing, it must be clogged. Since the valve is functional / you can control water flow, it’s either the tubing or the refrigerator. However, if I misunderstood your last sentence “If I remove the refrigerator water line, and leave faucet on I get a steady stream of water from the hole where the line goes” and by refrigerator water line you mean tubing and entire valve assembly, there might be something blocking the valve – take it apart and tap on it, blow some air into it / through the valve.